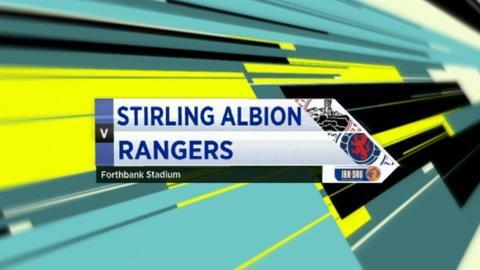 Rangers suffered a shock first loss in the Third Division after crashing to defeat against bottom side Stirling Albion. The hosts had lost their last five league outings but picked up their second win of the campaign after Brian Allison grabbed the only goal. Allison took advantage of dreadful defending in the eighth minute to bundle the ball over the line. Rangers pushed for a leveller thereafter but could not find the net. Having struggled on the road so far this season, this was the match which appeared destined to provide Rangers with their elusive first away win in the league. Ally McCoist's men faced a side rooted to the bottom of the table, whose manager Greig McDonald was absent from the dugout to attend his own wedding, and knowing victory would propel them to the Third Division summit. They were also boosted by the return from injury of key players Dean Shiels and Ian Black, who both started at Forthbank. Instead, it was Stirling who surged into the lead. Mark Ferry's corner to the back post dropped for Allison, who took advantage of slack defending to slot the ball past Neil Alexander. The visitors struggled to mount a response and with time fast running out for, Shiels delivered an inviting ball across goal for substitute Kevin Kyle but the big striker failed to connect in front of the gaping goal. Shiels then stabbed wide in the final minute as Albion held on for the win. Stirling: Filler (Peat 46), McClune, Thom, Allison, McAnespie, Graham Weir, McSorley (Day 59), McCulloch, Ferry, Steven Weir (Flood 88), White. Rangers: Alexander, Argyriou (McKay 67), Perry, Emilson Cribari, Wallace, Faure, Black (Naismith 85), Macleod, Aird (Kyle 71), Shiels, McCulloch.